Japan will release the BSI Manufacturing Index data, and the US will publish some Economic Data such as Beige Book, 10-y Bond Auction, Crude Oil Inventories, Core PPI m/m, and PPI m/m. 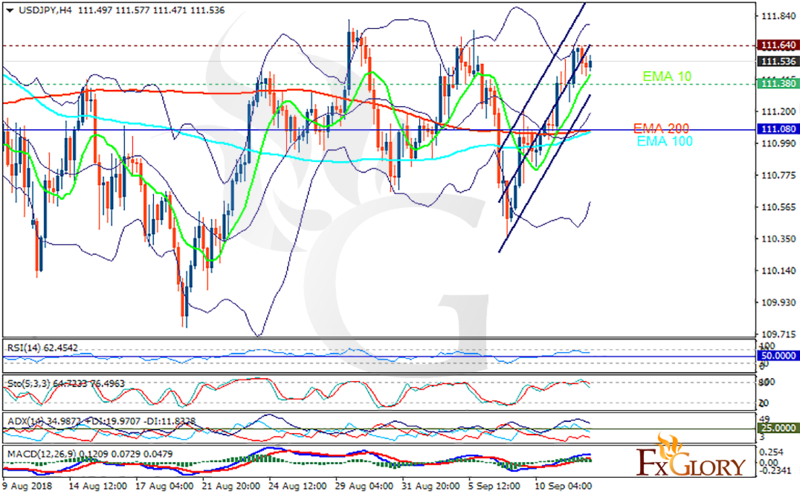 The support rests at 111.380 with resistance at 111.640 which both lines are above the weekly pivot point at 111.080. The EMA of 10 is moving with bullish bias in the ascendant channel and it is above the EMA of 100 and the EMA of 200. The RSI is moving above the 50 level, the Stochastic is showing downward momentum and the MACD line is above the signal line in the positive territory. The ADX is not showing any clear signals. The resistance level breakout may push the price higher towards the upper Bollinger band at 111.7, otherwise, the price will fall towards the lower band at 110.5.